Be proactive when you come across the right home. With Appraisal Guarantee, there’s no need to wait for the inspection to come back before ordering the appraisal. Enjoy peace of mind and get home faster. Eliminate delays and close faster with Appraisal Guarantee. Contact a Guaranteed Rate Affinity loan officer today! *Valid for participating borrowers through 12/31/2019. Only applies to purchase contracts terminated as a result of home inspection and only for appraisals scheduled before inspections. 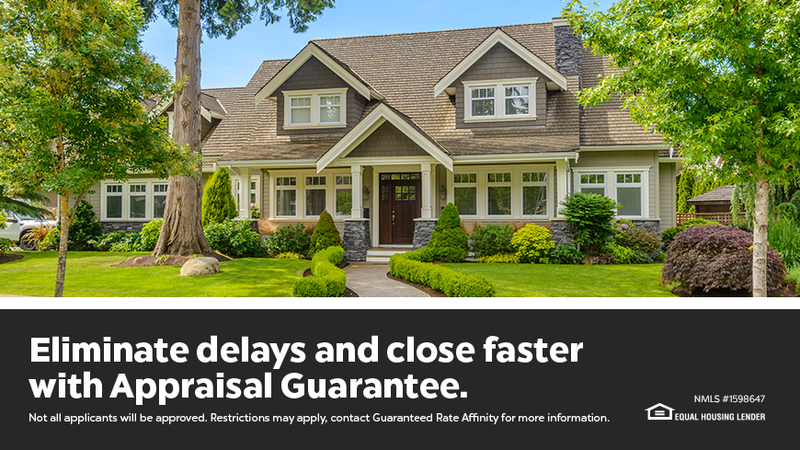 Guaranteed Rate Affinity will issue a credit up to the cost of the original appraisal. Not all applicants will be approved. Other restrictions may apply. Contact Guaranteed Rate Affinity for more information.